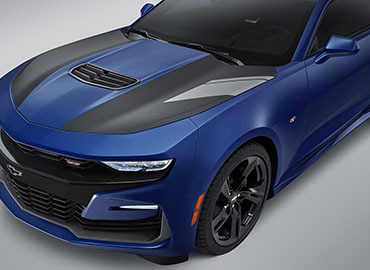 Offering driver-centric technologies that enhance the performance driving experience, the 2019 Camaro makes brute force a thing of the past. Its new Chevrolet Infotainment System adds real-time traffic information to the available navigation system, allows Bluetooth® capability for two active phones at once, and more. Standard on 2SS and ZL1 (excludes 1LE), the Rear Camera Mirror offers a less obstructed view of the world behind Camaro. It employs a camera tucked away under the rear spoiler to offer a real-time display with zoom, vertical tilt and brightness adjustments or a traditional inside rearview mirror. Lane Keep Assist with Lane Departure Warning is an available camera-based system that warns you when you're unintentionally drifting from your lane and helps gently nudge your steering wheel to help prevent lane departure if you don't take action.